These are the words uttered in an IBM ad by a person in response to a question raised by another person who walks into a big hall where many people are lying down. Now this itself is an idea of allowing people to take time to ideate. A senior executive in one of my client companies quipped, "if we follow this, then rest assured we will have lot of people volunteering to ideate; only that it will generate more snoring". Not that he is not impressed by the idea but just that he is far from impressed with his people. There are two things here, one you don't need to have a big hall for people to come, lie down and ideate and secondly ideation is not something to be thrown open for people take up voluntarily. Businesses know the value of ideas but often they don't promote conducive environment for ideas to grow and get nurtured. Ideation process helps companies to generate ideas to address and solve business problems and support innovation. Knowledge management system helps a business to generate ideas as long as issues concerning sharing of knowledge are well addressed and people are open to share and use knowledge. In a way a KM system is a prerequisite for ideas to come through and surface. Like many other things in a business, ideation requires necessary infrastructure, facilities and conducive environment for it to work. It may not be a continuous process and certain steps can be skipped if the motivation is greater. 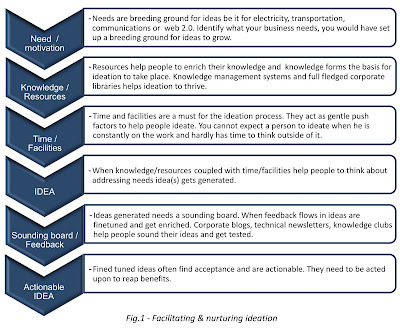 The diagram given below capture things those are necessary for ideation to take place in a business environment. It however does not cover the cognitive process that creates the idea. Click on the picture to enlarge it. Find ways to encourage people to use the library. Discourage people taking resources home. Encourage people to set up knowledge or say even Idea clubs to meet (online or in person), communicate, share and discuss issues, ideas and knowledge. Integrate it with the KM system. Set up corporate blog or publish periodic internal newsletters. Encourage people to contribute and reward valuable contributions. According to Psychology Today, I find that a survey by the American Management Association asked 500 CEOs this question, "What must one do to survive in the 21st century? ", and got the top answer, "Practice creativity and innovation", though only 6 percent felt they were doing a great job at it. "Several years ago, Bell Labs brought in a speaker whose talk about nature led to the idea for new technology. Roger Payne, a world expert in whale communication with a Ph.D. in ornithology, described to the group his major finding: that whales sing to each other to communicate, but that they change their language patterns each year. Payne noticed this phenomenon in contrast to birds, which keep the same pattern year after year. Halfway through his presentation, a scientist jumped up and ran out of the auditorium with an idea on how to improve communications between submarines. The stimulus helped him make a connection to a problem he was trying to resolve in another setting. External structures for positive turbulence provide opportunities for both individual and organizational innovation." The article also discusses creativity games, it could be relevant to this post. Anyway I am happy I read your post, and expect more on the question of creativity in the workplace. I will read that article. Creativity at work is another fascinating topic. I have been working on this topic. It's easy to make an individual to innovate / think creatively but making an organisation achieve that is very challenging and difficult. This primarily because of the differences in individual and organisational goals and expectations. You need a successful KM system for innovation / creativity to thrive. There are lot of people issues that needs to be carefully addressed.